I understand his point statistically. Considering the impact he displayed as a rookie in 2010, Suh made shockingly few plays in 2011. Not only were his sacks down from 10 to four, his other numbers dropped precipitously. He went from 66 tackles to 36. 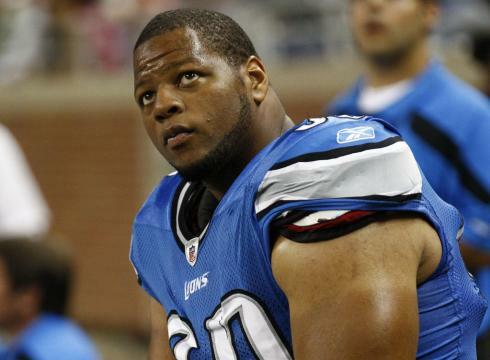 Suh had a forced fumble, a fumble recovery, an interception and a touchdown as a rookie. He did none of those things his second year. He also missed two games because of an avoidable NFL suspension (and the second half of a close game against Green Bay after he was ejected for his infamous stomping incident). Suh tied for 333rd in tackles and 90th in sacks in the NFL last season - hardly the numbers of the Top 100 player he is reputed to be, even for a defensive tackle, a position where it not easy to rack up impressive stats. He is incredibly strong, and extremely athletic for his size. I see last season as the growing pains of a player who will likely mature into a truly great NFL player for years to come. I don't think that makes him overrated, just a bit off track and about to get back on. It's not exactly a secret how much I love baseball. One of the biggest reasons is the tradition of the game. It's stronger and etched much deeper in our collective soul than other sports. Nothing is more traditional about the game than the Hall of Fame. I consider it a privilege that I have a vote for the Hall of Fame. I particularly liked it when I first started voting in 1996 - when it was all about performance and nothing about performance enhancing drugs. Who should we vote in now that the truly greatest stars of a generation have been implicated for cheating. 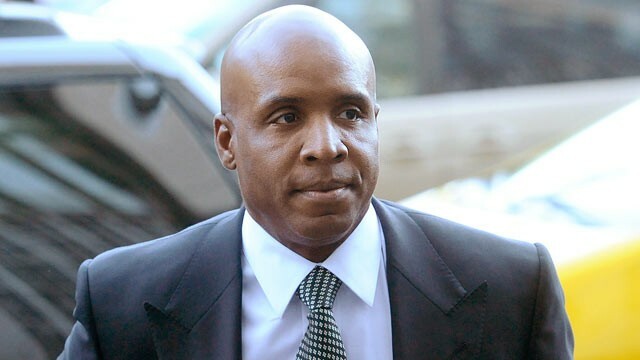 The two best position players I have ever seen are Barry Bonds and Alex Rodriguez. 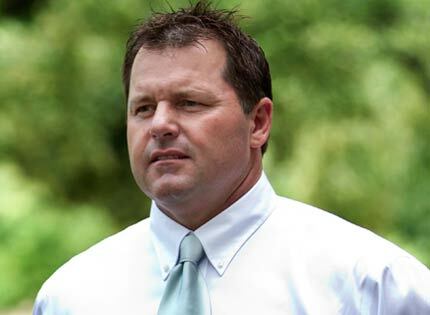 The best pitcher I've ever seen is Roger Clemens. Clemens wanted to prove himself innocent of the charges made by his long time trainer that he injected him with performance enhancing drugs. So there was a Federal court case, which like the Bonds' case (he was convicted of one count) was a waste of taxpayer money. Clemens was acquitted of lying to Congress.But I still don't feel Clemens is any different than Bonds on this front. I don't believe either has come clean about it. I strongly believe Clemens' former trainer, as shady a character as he may be, was telling the truth. I think most of the nation does, too. Pitchers just don't from throwing 90 mph to 98 mph in their late 30s. A-Rod tested positive before it involved suspension and made it sound like a one-time mistake or something. I don't believe that, either. Bonds and Clemens are on the Hall of Fame ballot this coming year. I think I'd be remiss in upholding the tradition of the game if I voted for them. I believe that when I was a baseball writer, covering the game on a daily basis for 13 years right in the middle of the steroids era, I was remiss in not pointing out the great fallacy of the game at the time, and not working harder as a reporter to prove it. It wasn't like people were parading around the clubhouse with needles in the hands, but there was this "wink-wink" mentally from players and front office personal when a player's performance either spiked or dropped suddenly. It was about whether a player started or stopped using PEDs. It took leaked grand jury testimony and two highly skilled investigative reporters in San Francisco nearly going to jail to crack the performance enhancing drug issue in baseball. They lived up to the tradition of my profession. Sports writers covering baseball at time - myself included - did not. I feel like I let down the tradition of the game down back then. And I'm not going to do that again by voting these players into the Hall of Fame, at least initially. I'll try to keep an open mind. Issues are fluid. It's foolish, I feel, to draw a line in the sand and never move off a stance, if evidence changes. I'd be interested to hear what baseball fans think about this. Ultimately, it's your game. There is a comment box below. Quintin Berry went 5-for-5 in the Tigers' victory over Colorado Sunday, and he is suddenly being hailed as a savior for the club. 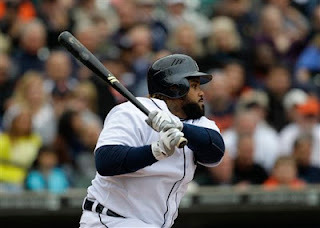 But in truth, Berry has played a minimum role in the Tigers' recent 10-game flurry, which has seen them win seven times to move within three games of the lead in the decidedly mediocre American League Central (only in this division, it seems, can a club make up make three games so quickly with such a modest "surge." Actually, the Tigers let the three losses get away late in those games; they should have a 10-game winning streak going and be tied for the division lead). In the seven victories, Berry hasn't exactly been a run producer. He has one RBI and three runs scored. Even in the Tigers' victory Sunday, he scored one run, and didn't knock in any. He had been hitting .182 in the two weeks leading up to Sunday. In truth, the biggest reason is the Tigers have been able to turn it around is the return of Austin Jackson, who replaced Berry in the Tigers' starting lineup. The idea Berry is "fresh and new, a youthful infusion of energy into the Tigers lineup" is laughable. He is older than both Delmon Young and Brennan Boesch. When Boesch had a 4-for-5 night, hitting a home run, driving in two runs and scoring two at Wrigley Field recently, there wasn't the start of "Boeschemania." Young isn't having a very good season offensively based on his career numbers, but he was 10th in AL MVP voting as recently as 2010 and did hit three home runs and have an OPS of 1.170 in a tight, five-game ALDS victory over the Yankees last fall. There is a track record there. 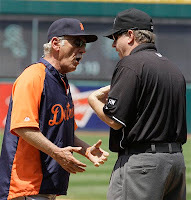 The criticism of manager Jim Leyland not playing Berry more is foolish. 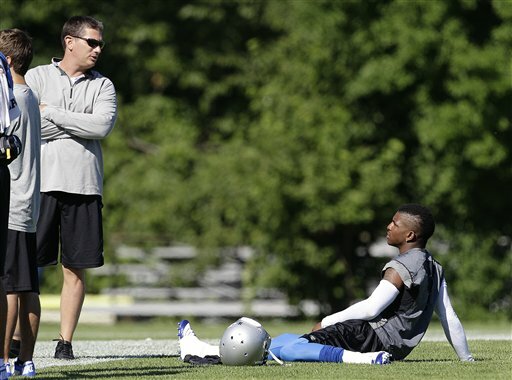 He is picking his spots where Berry can have an impact. Leyland rode Berry while he was hot, sat him when he cooled down and put him out there on Sunday against a right-hander with an ERA pushing seven and a WHIP over 1.8, Jeremy Gutherie. All that is not meant as a knock on Berry. He was a great minor league free agent signing for the Tigers, and did a terrific job bridging the time Jackson was out. He is a tremendous story. Fans are rooting like crazy for him in this town, and they should. He certainly earned his spot on the club. 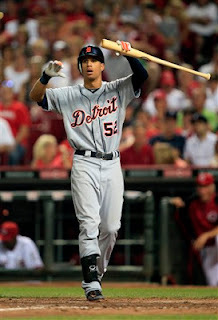 But Quintin Berry is, at best, a role player, and a relatively small piece of a much bigger puzzle.If the Tigers are forced to ride him - if Young, Boesch, Dirks, Ryan Raburn don't come through - they will be on the train to nowhere. It's not a coincidence in the four games since center fielder Austin Jackson returned to the Tigers' lineup, they have won three times, and, really, should have won all four. Jackson has delivered clutch hits and made a truly great catch Wednesday. For a club that is frustratingly challenged defensively and has a little overall speed, Jackson's value as a multidimensional player cannot be overstated. Not only does he run very well, but he has gradually developed power. 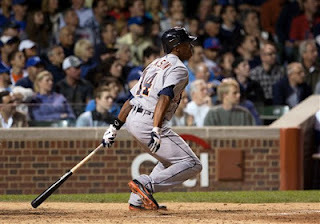 His slugging percentage is .125 higher so far in 2012 than his career mark entering the season. The Tigers are 21-19 in games Jackson has played. When he's been out of the lineup they are 8-14. In the 21 games the Tigers have won this season with Jackson in the lineup, his OPS has been 1.049. 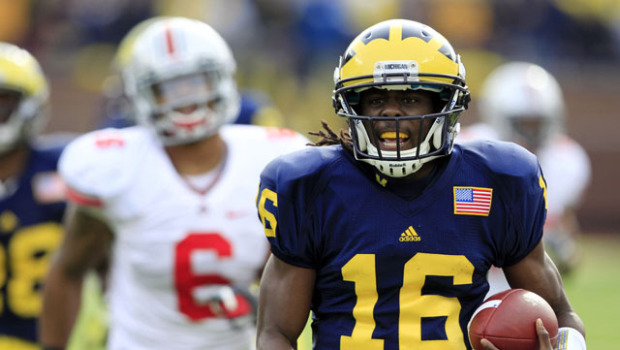 In many ways, his performance is the biggest gauge whether the Tigers will win on a given day. 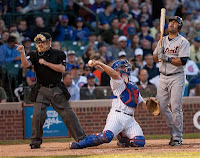 If the umpires had called the base runners out rather than safe on close plays in the bottom of the eighth inning Tuesday, perhaps the Tigers' 4-3 loss to the Chicago Cubs would have turned out much differently. Both were close plays, a force at second base in which it appeared Ramon Santiago barely kept his foot on the bag, and Prince Fielder did a nice stretch at first. But here's the bottom line: Both those throws by Tigers shortstop Jhonny Peralta were terrible. They were easy plays turned into nightmares. 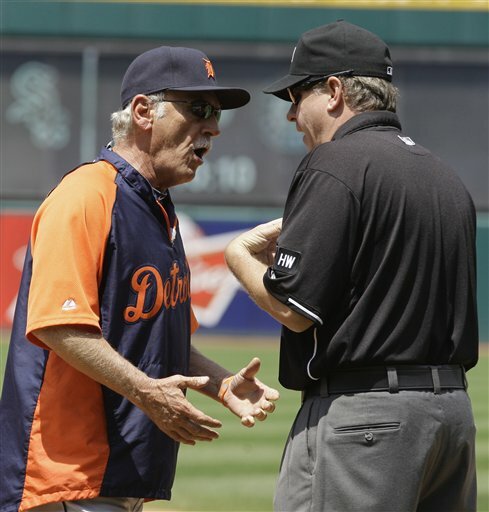 It wasn't so much the Tigers got a tough break because of missed umpire calls as Peralta's unnecessarily turned them into close plays. He makes a good throw on either play, and it's not even an issue. The Tigers would have probably won the game because they had rallied against a club carrying a 20-40 record. Instead, it was arguably their most disappointing loss of the season. Any momentum they had gained from winning three of their previous four games was gone in an instant. 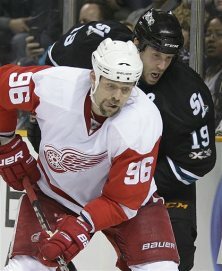 The issue isn't about what Tomas Holmstrom has done in the past. That is without question. He's long been an excellent player in a role - involving grit screening shots and taking shots from opposing defensemen in front of the net - the Red Wings have been otherwise largely lacking down through the years. 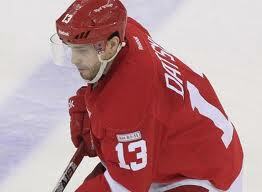 But it's difficult to imagine why the Red Wings would want to bring him back next season. He is going to be 40 when the playoffs start. He played only 11 minutes per game last year, even less during the playoffs. He has never been a brilliant skater, but it was particularly noticeable how he struggled to keep pace last year. On the good side, he was second on the team in power play goals with 10, but he was minus 9, his second straight minus season. Holmstrom had one even-strength goal all season, and wasn't, frankly, the answer for the Red Wings' power play, which was surprisingly awful last season. Holmstrom wants to play again, but he is more willing than able at this stage of his career. If you're take sentiment out of the equation (which, granted is difficult given all Holmstrom has been as a player and person) and are honest about it, the wise move by the Red Wings would be to quietly talk Holmstrom into retirement. - The criticism the Tigers receive for their mediocre drafting is usually valid, but they made a terrific decision in 2004, which has shaped the franchise for years to come. 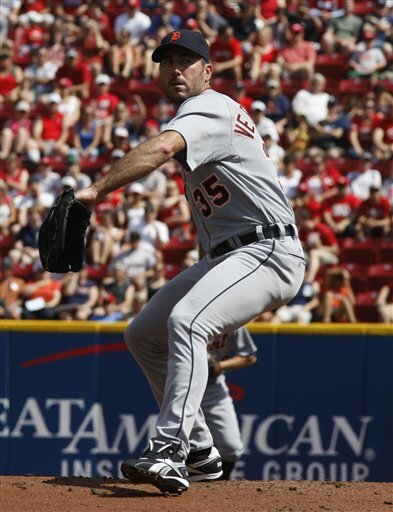 With the second overall pick, they selected Justin Verlander. 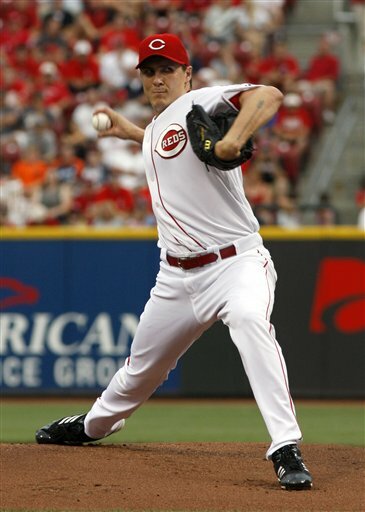 The Tigers had strongly been considering Homer Bailey, a high school right-hander from Texas, who pitched against the Tigers Sunday night for the Reds. Bailey is 26, has a 29-27 career record and never posted an ERA below 4.43 for a full season (he is at 4.35 this season). His career WHIP (walks and hits per innings pitched) is above 1.4. Phillip Humber, now with the White Sox, was taken third overall that year by the Mets out of Rice University. His perfect game this season was just one of 13 major league victories he has so far. Bailey, who had the option of pitching in college, dropped to seventh overall that year. The best other pitcher taken in the that draft by far was Jered Weaver 12th overall by the Angels. Verlander wasn't a no-brainer at the time. 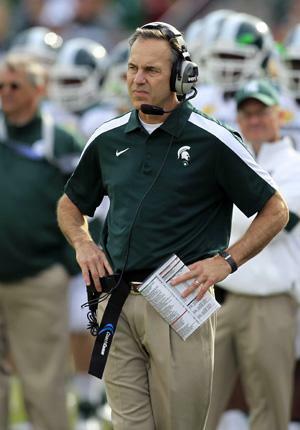 He had a 21-18 career record at Old Dominion. There was much debate about taking Bailey. The Tigers scouting director at the time, Greg Smith, won out on that debate. Greg Smith, now an assistant general manager with the Pirates, was also the force behind the Tigers taking Curtis Granderson in the third round in 2002. He turned out to be far better player than the Tigers first two picks that season, third baseman Scott Moore (who was drafted the pick after Prince Fielder by Milwaukee) and outfielder Brent Clevlen, who did have his 15 minutes of fame with the 2006 Tigers. 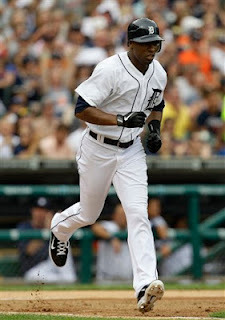 - Austin Jackson's return to the lineup can't emphasized enough. 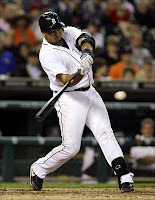 His home run was an important hit when it looked like the game might be slipping away from the Tigers early. His two-run double later was the key hit of the game. No Austin Jackson Sunday, no Tigers victory. Period. Quintin Berry can't come close to providing the Tigers what Jackson does offensively or defensively. 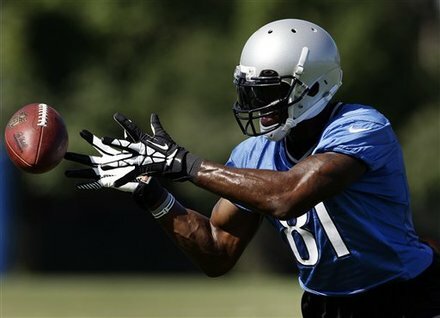 - There are a lot of reasons the Tigers won Sunday night. None was bigger than the bullpen. Brayan Villarreal has stopped being this wild card entry in the bullpen poker game and provided much needed consistency. Joaquin Benoit got a huge strikeout. 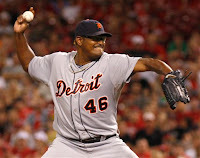 Jose Valverde has quietly simmered down and started to provide the Tigers with quality late-inning pitching. 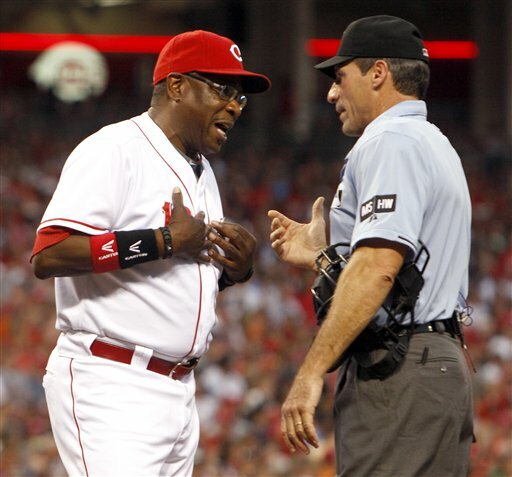 - The worst umpire in the history of baseball might be Angel Hernandez. His inconsistent strike zone is an embarrassment to the game. 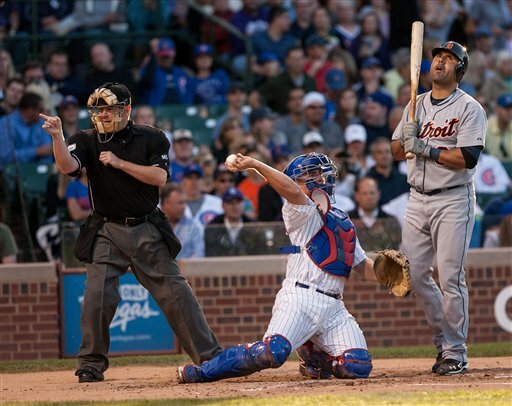 It's amazing they would put him behind the plate during a nationally televised game like that. - "Most 4+ RBI games this year, MLB: Brandon Inge 5, Carlos Gonzalez 4." - "He has 20 RBI in 17 games, and you're worried about his batting average?" (Inge is hitting .212 for Oakland). 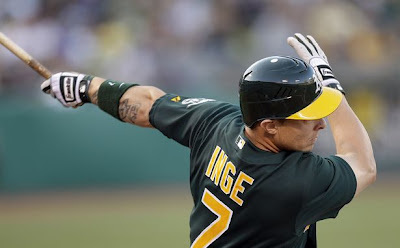 - "And just because you can never get enough Inge: 5th 4-RBI game in 17 games for A's, had 10 in 1,408 games for Tigers." Inge has had his moments with the A's, including an excellent series against the Tigers. Yet, he has been anything but a model of consistency for the A's. He has had four RBI in five games, and just one RBI total in 12 others for the A's.. He was 2-for-19 with no RBI in his previous five games after coming off the disabled list before Monday. My point about Inge is: How were the Tigers going to use him? His release didn't matter, one or another. It was moot. It neither helped the team nor hurt it. 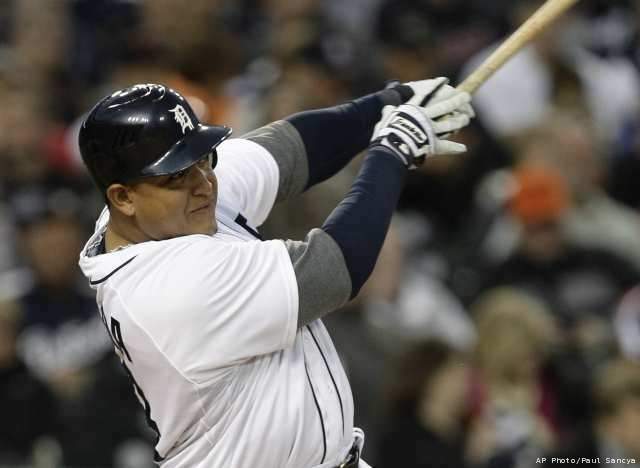 It was a case of the Tigers trying to fit a square peg into a round hole after they signed Fielder and moved Cabrera to third. At Oakland, at least Inge has a shot to have a big game now and then because he is playing every day. Even with five four RBI games out of 17 with Oakland his OPS is just .763 for the A's. 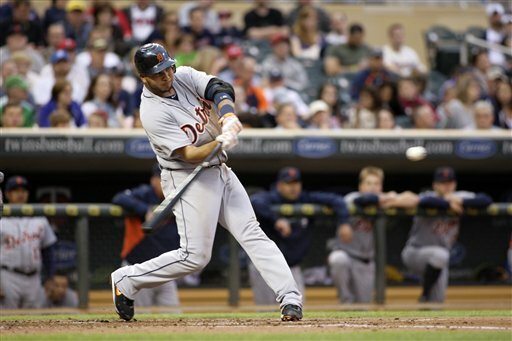 Counting his time with the Tigers this season, he is hitting .186. After Inge was released by the Tigers, he was followed on the hate bandwagon by many Tiger fans by Ryan Raburn. I agreed with the Tigers moving Raburn to Toledo. He was hitting .146. That is not earning your keep after two months. But both moves didn't cure what was ailing the Tigers. They have continued to play bad baseball. The Tigers slump wasn't about their fringe regulars. It's more about their every day players, who haven't come remotely close to their track records of the past (see the column below). Good for Brandon Inge, but he and Ryan Raburn were not the player the who were going to make or break the Tigers this season. This is the Oakland Press News at Noon Broadcast for Tuesday June 5. It focuses on the K2 issue in Oakland County. 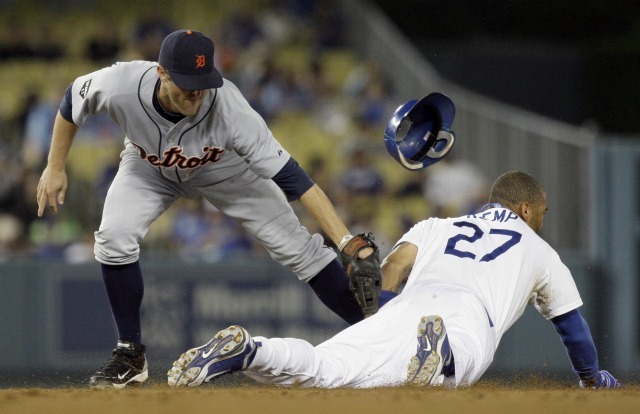 I have a commentary at the end about the Tigers series against Cleveland which starts tonight. Replay of my live video chat today. We talked about the Tigers' troubles, the retirements of Magglio Ordonez and Nicklas Lidstrom and Tiger Woods winning a tournament dramatically, and whether he is worthy of people rooting for him. Also, got into the Detroit Grand Prix a bit. We do this every Monday around 12:30 for about 45 minutes #OPchat on Twitter or merely put you question or comment in the comment box below to join in the conversation each week. We often give away a classic sports book to the best comments or questions. Check it out. Jose Valvarde's struggles as the Tigers closer moved from concern to alarming Friday night as the Tigers labored to a bizarre 4-3 victory over the New York Yankees. It put into question just much Valverde, who has been an effective closer in the past, particularly in 2011, can currently be trusted in the role. His WHIP (walks and hits per innings pitched) is 1.594. He has blown three of his 12 save opportunities and his command of the baseball is often dreadful. 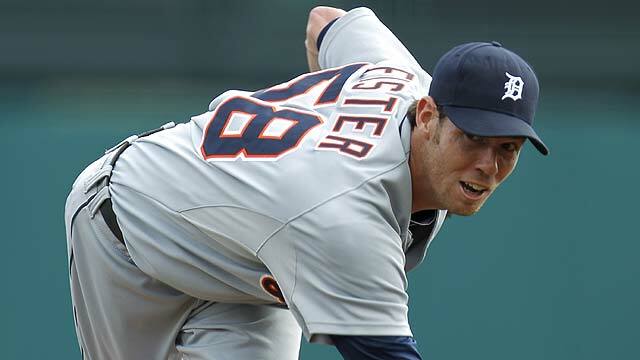 The Tigers need insurance for Valverde, and overall depth in the bullpen. They also need a versatile pitcher, who could start as well, if needed, and if Valverde can turn it around. 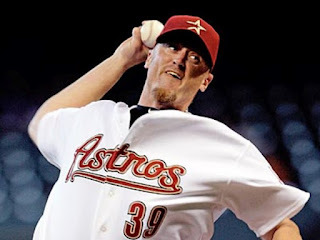 The ideal pitcher would be Brett Myers of the Astros. He has been moved to closer this year, and has 12 saves in 13 oppportunties. His WHIP is 0.873. Myers had been a successful starter throughout his career before this season. He pitched for good teams (the Phillies) in clutch situations. He is 31. He has a vesting option based on relief statistics (the Astros switched them when they made him a closer). If he reaches those incentives, his contract is reportedly for $10 million next season. There is a $3 million buyout.